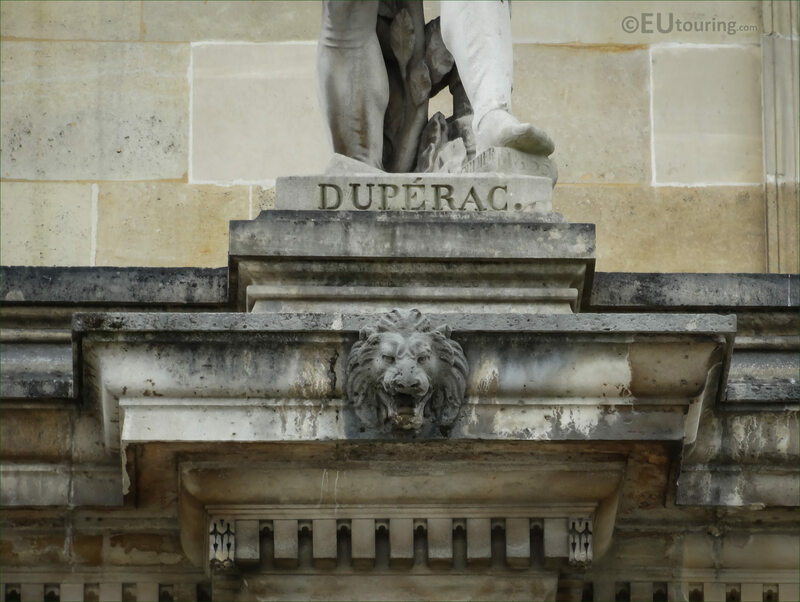 Again while we were within the Cour Napoleon looking at the Aile Daru wing of the Palais du Louvre in the 1st Arrondissement, we took these high definition photos of a statue dedicated to Duperac by the artist Cordier. 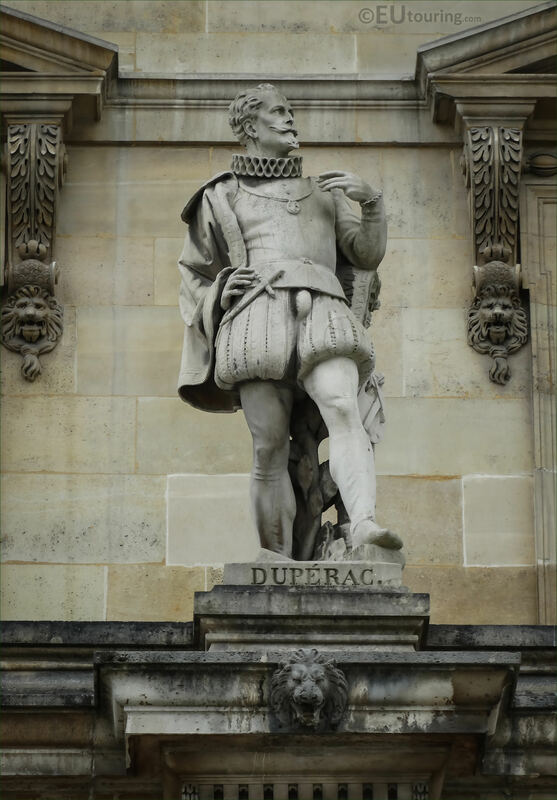 Now this first photograph shows the statue of Etienne Duperac, and this is located on the first level balustrade of the Aile Daru amongst other famous men within the history of France, and this particular stone statue is positioned in between the windows, third from the right as you are looking at the facade from the Cour Napoleon courtyard. And it was actually during the 1850s while much of the city of Paris was having major improvement and embellishment made for impressive buildings like the Palais du Louvre, that numerous different sculptors were commissioned to produce statues for the facades of this former palace, and the statue you can see here was produced by Jacques Ange Cordier, being put in place in 1857. So as you can tell from this last close up HD photo showing the plaque at the base of the statue, this is dedicated to Étienne Duperac who was born in 1525 and became a French architect, painter, engraver, and garden designer, with some of his most well known works being his topographical studies of Rome where he resided from 1550 through to 1578. 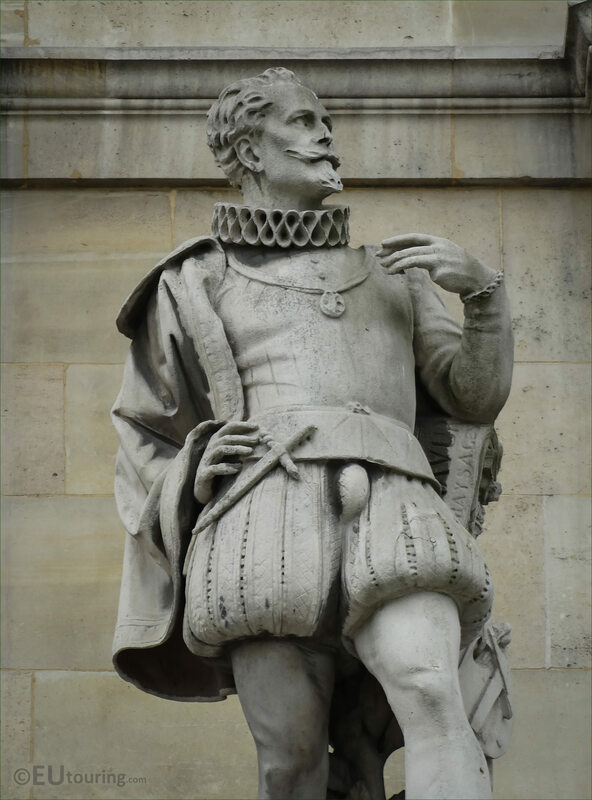 But upon his return to France, he brought back with him many ideas along with his engravings that helped pave the way for several architectural and garden planning ideas and worked as an architect for King Henri IV where he was engaged in work for the former Tuileries Palace, prior to passing away in 1604.